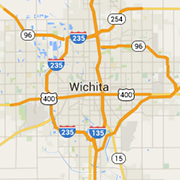 Planning a wedding, birthday party or big event in Wichita? Check out some of the area's best caterers, wedding planners, banquet halls, reception halls, bartenders, party rentals and more. Wichita weddings, parties and events start here. Serving Old Town Wichita with the best Barbeque in the area. Event catering available. Chester's Chophouse & Wine Bar is Wichita's classic steak house, featuring fresh ingredients and fine wines. Located on the Waterfront. Featuring talented pianists and great drinks in a classy and enjoyable environment. A Cultural Fusion Of The Best Mexican & American Foods! A European Cafe, Le Monde features delicious French, Italian and Mediterranean cuisine that is authentic yet affordable. Providing the best quality food and service in Mediterranean and Middle Eastern cuisine. Artisan pies baked in a wood fired oven, and a wide variety of hand-selected wines. The perfect size Wichita venue to hold almost any event from wedding receptions, class reunions, Christmas parties and more. We provide fun, fashionable photobooths for your wedding, party, prom, reunion, or any other event! Wichita's premier Chef Casual restaurant serving fresh, exciting, and healthy menu options. Where you and your friends can step back to a grander, more elegant time!